Food Logistics, the only publication exclusively dedicated to covering the movement of product through the global food supply chain, has released its Top Green Provider list for 2016. Food Logistics’ annual Top Green Providers list recognizes companies whose products, services or exemplary leadership enhances sustainability within the food and beverage industry. Food Logistics’ annual Top Green Providers list recognizes companies whose products, services or exemplary leadership enhances sustainability within the food and beverage industry. Food Logistics, the only publication exclusively dedicated to covering the movement of product through the global food supply chain, has released its Top Green Provider list for 2016. Food Logistics’ annual Top Green Providers list recognizes companies whose products, services or exemplary leadership enhances sustainability within the food and beverage industry. The list offers logistics professionals a guide to the providers, manufacturers, and software and technology companies that have found new ways to promote sustainability throughout their operations and those of their customers. 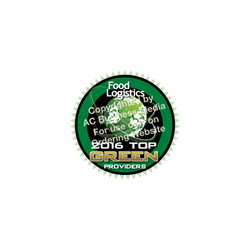 The full list of all of the 2016 Top Green Providers is available on the Food Logistics website at http://www.FoodLogistics.com. An expanded listing of members on the list appears in the June 2016 issue of Food Logistics magazine. Food Logistics is the only publication exclusively dedicated to covering the movement of product through the food supply chain. Every issue presents news, trends and best practices that will help grocery and foodservice manufacturers and distributors make better business decisions. With more than 24,000 subscribers, Food Logistics reaches corporate level executives at food warehouse and distribution centers, as well as on-site vice presidents, directors and managers. These executives make the critical buying decisions for the products, services and technologies that transport, store and track product throughout the food supply chain. Food Logistics is published by AC Business Media and is a division of the Supply Chain Network. AC Business Media is a business-to-business media company with a portfolio of renowned brands in heavy construction, asphalt, concrete, paving, rental, sustainability, manufacturing, logistics and supply chain markets. AC Business Media delivers relevant, cutting-edge content to its audiences through its industry-leading digital properties, trade shows, videos, magazines, webinars and newsletters and provides advertisers that analytics, data and ability to reach their target audience.